Is the Internet a vehicle of knowledge? Is it proper to talk of a knowledge society where science has transcended to a mass culture? In a debate broadcast on lariojacom.tv on November 4, 2011, Professor of Sociology at the COMPLUTENSE university of madrid, Alfonso Pérez-Agote, it is these and other questions and attempts to answer them with due caution convenient. For a little more than 20 minutes, Alfonso Pérez-Agote, talks about the complex process that has experienced knowledge in western societies, about the differences between the knowledge and the culture of the masses; between knowledge and information; the dissemination of information and the ability to produce knowledge. All in all, a great dissertation on the knowledge society and ICT by one of the sociologists who knows most about knowledge, culture, and religion. 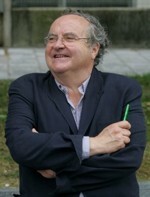 Alfonso Pérez-Agote Poveda is Professor of Sociology at the Complutense University of Madrid. Account with five sexenios of research. He chairs the Committee of Recherche no. 1 “Identité, Espace et Politique”, of the Association Internationale des Sociologues de Langue Française, and is a member of several european groups and international research, as well as of the Editorial Board of the CIS Madrid and two research groups with a rating of excellence. He has published more than twenty books, among the more recent are: The Social Roots of Basque Nationalism, The University of Nevada Press, Reno-Nevada (2006); Towards a New Culture of Identity and Policy, Bilbao (2006); The situation of religion in Spain at the beginning of the XXI century, Madrid (2005), Religion and politics in today’s society (2008), The new religious plurality (2009), multicultural Neighborhoods (2010).